Mangte Chungneijang Mary Kom is a female Indian boxer from a remote village in Manipur, India. She is a 5 times World Champion and the only female player in the world to have won a medal in each of the 6 championship under ‘World Amateur Boxing’ category. Additionally, she is the first female sportsperson to get the highly coveted Arjuna Award for her world class performance in boxing. She is lovingly called ‘Magnificent Mary’ for her humble background and stunning results. Last year, she wrote her autobiography: Unbreakable which was published by Harper Collins, and last week, Sanjay Leela Bhansali released a biopic on Mary Kom’s life wherein popular Indian actress Priyanka Chopra played her role to near perfection. The movie provides us with a glimpse of the hardships and challenges faced by her during her unorthodox career path. Here in this post, we have compared female boxing in India with entrepreneurship, and have tried to showcase 4 vital lessons which Mary Kom’s first coach Narjit Singh shared with her in the movie. Yes, female boxing and entrepreneurship are world apart, but the common binding link here is ‘passion’. The very first step towards achieving any goal in life is commitment. As shared by the coach in the movie, nothing can be achieved without commitment. The moment you have decided what your goal in life is, and have understood the meaning of your life, commit to it and don’t break the belief. In each and every frame of the movie, Mary Kom is being depicted showcasing relentless commitment, and in my view, this unbreakable commitment forms the base of her career. While giving her the training for boxing, the coach tells Mary Kom that boxing needs sacrifices – surrender everything you have go to boxing and then see the change. Your time, your happiness, your energy and resources, everything should be dedicated to boxing, and this is the secret recipe of success. Without experiencing the pain, how can a boxer understand what pleasure is? The coach clearly tells Mary Kom that without pain, there is no gain. Experience pain to come closer to success. Here, a very important lesson which entrepreneurs can derive is experiencing failure. Pain for an entrepreneur means getting failed in their endeavors and the importance of this experience can’t be stressed more. Often fear is associated with failure, and we have already stated why this fear is so important for an entrepreneur. As the training of Mary Kom initiates, her coach takes her into the ring, and tells her that from now on, her world is not round but this square ring where she needs to fight it out. The game needs her undivided and pure focus and if she is able to provide that, the game is hers. While managing a company and business, the entrepreneur often loses the focus and gets distracted by the smaller issues which can be managed by others or which can be avoided. This focus on the ‘Why’ part of the whole thing becomes one of the most important aspect for an entrepreneur. Before beginning, he should clearly be aware of his mission and vision, and this is focus. Just like an entrepreneur defies all logic and goes against the stream when everyone says that it’s impossible, Mary Kom became the most famous Indian boxer from a small remote village in Manipur and conquered the world. In case you are looking for that push, that little inspiration to give wings to your dreams and to do the impossible, do watch this movie, and get tons of motivation. Do share your views on the movie by commenting right here. 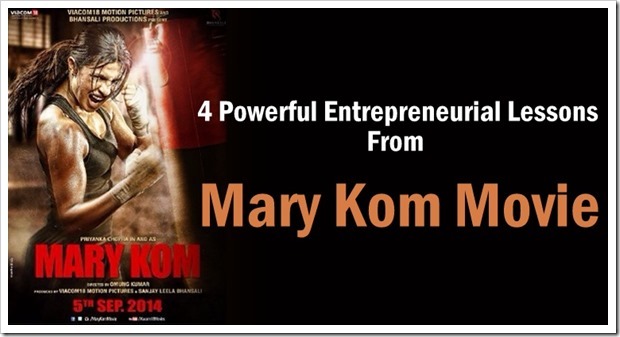 "4 Powerful Entrepreneurial Lessons From The Mary Kom Movie", 5 out of 5 based on 1 ratings.